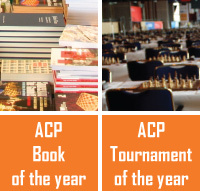 ACP is pleased to inform our members about the new cooperation - the agreement with one of the best open tournaments in the world, the chess.com Isle of Man International, which will take place in October 2018. There will be five wild cards for the ACP Premium members in the event, three for men and two for women – each of the players receiving 1500 GBP starting fee. The wild cards will be distributed according to the ACP Tour-2018 standings (March 31 for men, May 31 for women). Two spots (man+woman) out of five are reserved for the non-European ACP members. In addition, ACP will introduce a special prize for the highest-placed ACP Premium member who won't win a regular prize in the tournament. We would like to thank the organizers for the cooperation and wish them a splendid event.